Before watching 'Once Bitten' I watched 'My Best Friend is a Vampire', It was practically like watching the same film twice in a row, actually this was the third Vampire related comedy Ive watched in two days. While I couldn't really review that film, I will try my best with 'Once Bitten'. A Vampire countess is in need of virgin blood in sustain her beauty for eternity, she meets a quirky teenage virgin named Mark Kendall, who is just what she is looking for, but Mark is not in on the act and is very confused when he starts displaying Dracula like tendencies. 'Once Bitten' is a purely 80's comedy, I wasn't alive during that time but the film feels like a time machine, showcasing the crazy views and values of that time, the film is a fun yet hilariously obsolete watch because of its outdated approach to teenage attitudes. The vampire sub plot honestly feels secondary at times to what Mark's growing through, his frustrations with puberty and what not. The film is a little too unfocussed and inconsistent, its billed as horror comedy but spends basically all of its time on comedy, I actually don't think there is at least one thrilling scene throughout the entire picture. Does the film get the comedy right though ? honestly its a little hit and miss, As I alluded to earlier the attitudes of society have changed immensely since 85, and seeing as the film is so installed in that time, its comedic elements have become quite obscure, but in most cases it honestly makes them even more humorous, with that being said though I don't think I laughed throughout duration, but I did enjoy Jim Carrey's wacky antics at times, and the ''Fags in shower scene'' was quite awkwardly funny. The film constantly alludes to homosexuality and its really quite strange, especially since it was released in the same year as 'A Nightmare on Elm Street Part 2: Freddy's Revenge'. 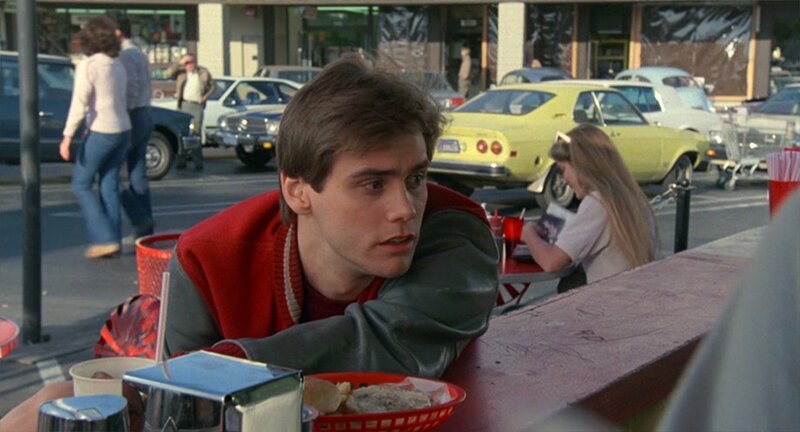 The film features Jim Carrey's first prominent role in film, and he does quite a decent job and is usually quite enjoyable throughout as he is the central character and we witness all his crazy changes he is experiencing throughout the film, and how he deals with them. Lauren Hutton is the only cast member that makes the film worth watching, she plays the countess and is entertaining in the role. The rest of the cast is pretty woeful, especially Karen Kopins who is constantly irritating in the girlfriend role. 'Once Bitten' was released in 1985, the same year my all time favorite Vampire film,'Fright Night' was released, its needless to say that it pales in comparison to that film, it even pales in comparison to 'Fright Night Part II', Hell it may pale in comparison to every damn vampire film of that decade, but can 'Once Bitten' still be considered enjoyable by today's standards ? in my opinion, it depends on your mind set, If you go in just wanting to see Jim Carrey and expecting nothing from the film as a whole (as I did) you may get a few laughs, but if your intending for it to be a frightening comedy then you will be disappointed. 'Once Bitten' is not a film I can whole heartedly recommend, but if your curious its on Youtube. I don't recommended paying for a DVD however.